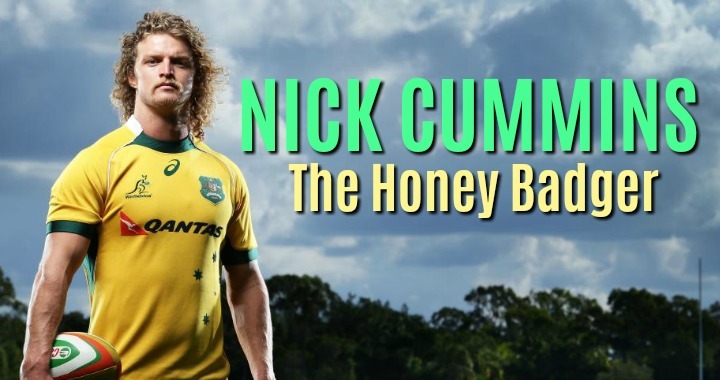 Nick Cummins (also known as The Honey Badger) is an Australian professional Rugby union footballer. He played for the Western Force in Super Rugby and for Coca-Cola Red Sparks in the Japanese Top League. Nick has represented Australia at the Commonwealth Games and other international matches, in both the Australian Sevens team and the Wallabies. His usual position is Wing. Why did they call him ‘The Honey Badger’? Nick was called ‘The Honey Badger’ by his fans after he drew inspiration from the fierce nature of the honey badger – having the same ‘never-say-die’ attitude when he's playing on the field. Nick's whole idea on the honey badger game style began when he was watching a documentary on Animal Planet. He said, "I was watching Animal Planet one night and this thing came up. It's an absolute machine, it has no natural predators and is the size of a house cat. I just thought: ‘This is me. I need to be a badger.’"
Because of Nick's broad Australian accent and very Australian attitude, he has been featured in several ad campaigns as an "Aussie Larrikin" character. Nick was the new face of Tradie underwear and workwear for men in August 2015 and was also featured in small TV campaigns for Head & Shoulders in 2014. In October 2017, he became an ambassador for Tourism Australia. He was also featured in a small ad for beer company Iron Jack over Christmas in late 2017. If you would like to know more about Nick Cummins and his keynote presentations for your next corporate event click here to submit your enquiry or contact us directly on 1300 55 64 69. Since his famous post-match quotes and one liners went viral during his successful international rugby career, Cummins has grown a substantial following and audience via social media. Well regarded for his comical approach to life and delivery he has caught the attention of publishers, major brands and television executives in a very short period of time. Read more.